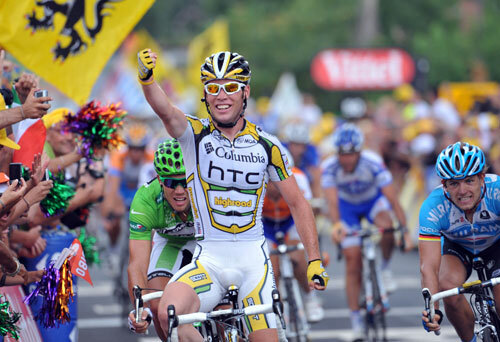 Mark Cavendish took his fifth stage win today making him the most successful British Tour de France rider in history. The young Manxman battled over the second cat climb of the Col de l’Escrinet on stage 19 to stay in contention and then take his ninth Tour stage win in just three years as a professional cyclist. The tally takes him past Barry Hoban’s record of eight, and sees him rapidly homing in on the number of victories achieved by the best sprinters of previous generations. 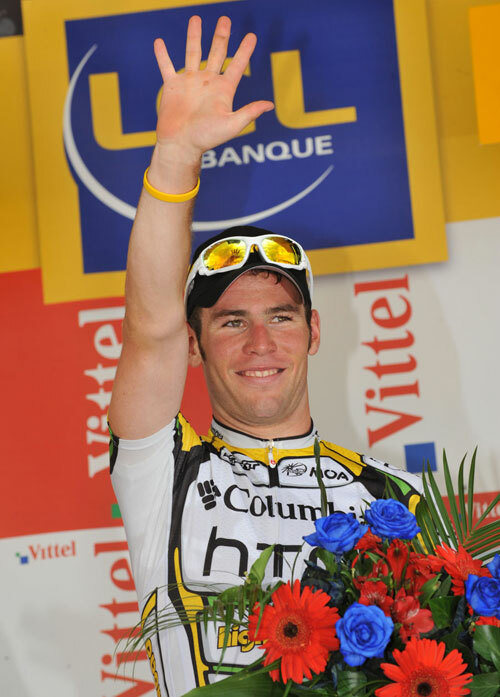 The unexpected win also sets up the possibility of Cavendish making it six stage wins on the Champs Elysees on Sunday. A feat not achieved since Freddy Maertens won eight stages in the 1976 Tour. Maertens won five stages in 1981, but since then no sprinter has won more than four in a single race. Should Cavendish win on Sunday and take a sixth stage, he will be confirmed as one of the greatest sprinters of all time, at the tender age of 24. Today’s win was his hardest yet. With a second cat climb topping out at 16km to go, few would have predicted a bunch sprint this far in to the race. In fact, it wasn’t a bunch sprint as the leading group had no more than 30-40 riders in it. Crucially all the sprinters were in it, except for Tyler Farrar (Garmin), as they positioned themselves well on the Col de l’Escrinet. Both Cervelo and Rabobank forced the pace on the 14km climb. The gradient averaged just 4.1 per cent but both teams obviously thought their sprinters could survive better than Cavendish. Before the climb, the Brit had told his team mates to stay with him in order to help him chase back on should he need to, but every time the camera flicked back to him he looked as comfortable as anyone did in the long, lined-out bunch. Behind him riders were getting dropped, but riding in the top 20 in the shelter of his team mates, Cavendish was never in trouble and made it over the top with all the leaders. With a descent all the way to the finish, Columbia then faced problem number two. Only George Hincapie, Maxine Monfort and Tony Martin were still there. The three would have to chase down Laurent Lefevre and Alessandro Ballan, who had a 13 second lead over the top of the climb, ride at a high enough pace to keep the bunch together, and then lead out the sprint. Lefevre and Ballan were caught with just under 2km to go, and with 1km to go Cavendish only had Martin in front of him. Somehow the German kept the pace high enough to foil any counter attacks, although the tight, twisty final run-in would have also helped. He also had to do Mark Renshaw’s job and get Cavendish up to speed for the sprint. Cavendish waited and waited, until he could wait no longer. Eventually he had to go, but with a slight rise to the finish he had his work cut out to hold off Thor Hushovd (Cervelo) in a long, drawn-out sprint. But the Norwegian took a while to get up to speed. He was slowly closing in on Cavendish by the time he hit the line but was never going to close the gap and was perhaps left ruing his decision to go on a lone break through the mountains two days before. The win saw Cavendish claw back five points on Hushovd in the green jersey competition. There’s an intermediate sprint 48km in to tomorrow’s stage, but in reality, with a 25 point cushion the Norwegian can only lose green if he fails to contest Sunday’s sprint and Cavendish wins or comes second or third. Once again, Britain’s Bradley Wiggins (Garmin) was unfortunately caught behind a small split in the leading group as he approached the line. Incredibly, Lance Armstrong was once again in the right place at the right time and put four seconds in to the Brit and every other rider in the top ten barring Christophe Le Mevel (Francaise des Jeux). Armstrong finished in 12th spot on the same time as Cavendish, while Wiggins was in 14th spot, four seconds down. The result now means Wiggins is 15 seconds down on the American who sits in third place on general classification. Wiggins now needs to gain 16 seconds on Armstrong by the top of Mont Ventoux if he is to make history and become the first Briton to finish in the top three of the Tour de France. Although there was clear daylight between Armstrong and Serguei Ivanov, who finished in 13th, there were also gaps behind Wiggins, although every other rider was given the same time as the Brit. When the same thing happened on stage 10 the race jury later changed their mind and nullified the time gap. Wiggins will be hoping for more of the same. 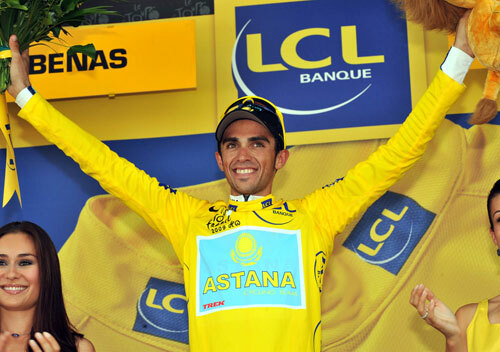 Le Mevel benefitted from being the right side of the four second split, swapping places with Mikel Astarloza (Euskaltel-Euskadi) from 10th to ninth. 10. Martijn Maaskant (Ned) Garmin-Slipstream all at same time. Stage 15 analysis: Is the Tour now over?